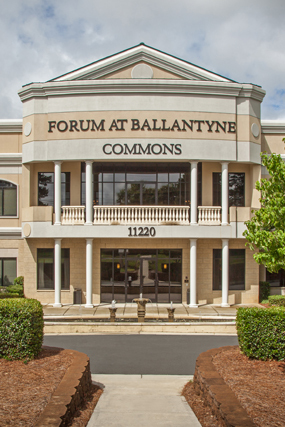 Welcome to the Forum Business Center at Ballantyne Commons – Are you in search of office space? We offer an elite, professionally staffed business center with furnished private, shared and temporary office space options; virtual business services and various size meeting facilities. Our clients enjoy the beautifully detailed upscale interior decor, professional business services, amenities and competitive fixed price monthly packages. We offer furnished executive window offices and a large domed conference meeting facility that all face a park like setting. There is something to be said about "a room with a view." The Forum Business Center's main conference board room, which features a stunning marble domed ceiling, stretches the length of the building's front balcony and overlooks a park like setting. The view offers an impressive environment for productive meetings to take place. The luxurious finishes include decorative columns, marble floors, floor to ceiling glass, a 16-seat boardroom table, screen projection wall, speakerphones, fireplace, access to balcony, catering options, food service area and various lighting options. The Forum Business Center is located within a mile of access to I-485, world class golf, hotels, restaurants and shopping. The Forum Business center is less than a mile away from access to I-485 and the Stonecrest Shopping Center in Piper Glen. Forum Business Center clients enjoy just being a few minutes drive away from state state-of-the-art business accommodations at Aloft Charlotte Ballantyne Hotel and golf at the luxurious Ballantyne Resort Hotel & Spa. There are four additional hotels within a two-mile radius and countless restaurants including Nikko Sushi Bar, Terrace Cafe, Mellow Mushroom and City Tavern. Copyright 2013 Forum Business Center, LLC., All Rights Reserved.